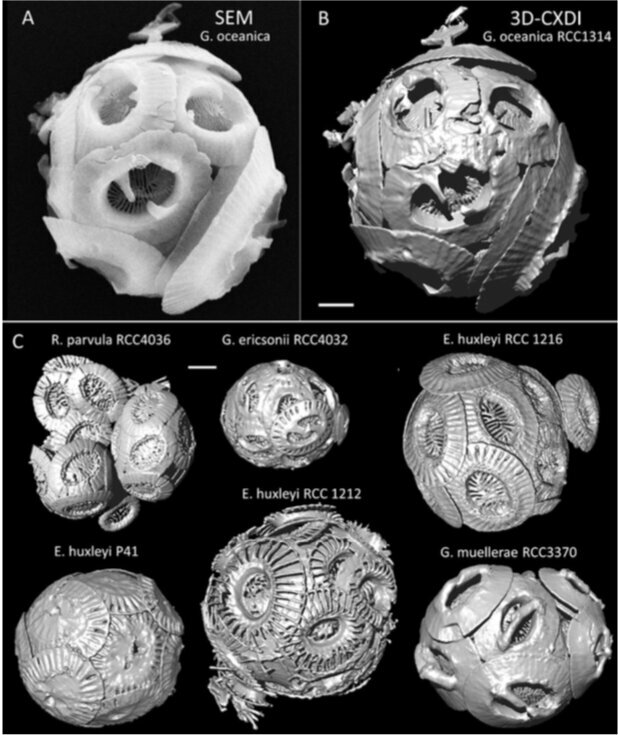 Coccolithophores are microscopic marine algae that use carbon dioxide to grow, and release carbon dioxide when they create their miniature calcite shells. These tiny, abundant planktonic microorganisms could therefore be seriously impacted by current increasing carbon dioxide emissions. Scientists from the CNRS, Le Mans Université, Sorbonne Université, Aix-Marseille Université and the ESRF, the European Synchrotron, have revealed the nano-level 3-D structure of their calcite shells, providing new perspectives for assessment of the role of these tiny microorganisms in the global carbon cycle. A study published in Nature Communications shows new correlations between their mass and the size of the organic template around which the calcite nucleation and growth take place. About one-third of the carbon dioxide released into the atmosphere as a result of human activity is absorbed by the oceans, where it reacts chemically and makes the water more acidic. This, in turn, makes it difficult for certain calcifying marine organisms, such as sea stars, sea urchins, corals, and coccolithophores to build their shells or skeletons.